Hey everyone! 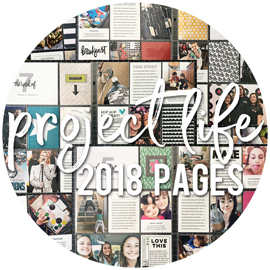 I wanted to let you know that I've shared a few blog posts on the Scrapbook & Cards Today blog this week, in case you want to check them out. I'm talking about how I organize my girl's school stuff, set up their school albums, and giving you a peek into what a school year looks like within those albums. Some of you long-time blog readers of mine might recognize a lot of this, as I've blogged about my school albums several times over the year. But these are new posts that I wrote, and they do include a bit of new info along the way. On Monday's post, seen HERE, I shared how I organize all of the school "stuff" that we collect during a typical school year. I also mentioned some of the supplies I use for my albums, such as the albums themselves and the different types and sizes of page protectors that you'll find within those albums. And on today's post, seen HERE, I am walking you through a single school year, as seen in one of Alyssa's albums. I find great joy in gathering up all of the school "stuff" at the end of each year, sorting it out, slipping things into the albums, and then tossing everything else (there are exceptions, and things that do get kept and stored elsewhere). It always feels very freeing! I thought I would pop back in here tonight with another Bella Blvd CHA layout share. 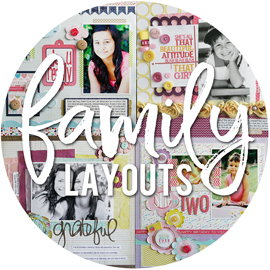 This is one of four layouts I created using the new Daily Chevies & Everyday Bits collection. I borrowed these adorable photos that my friend Krista took of her three kids. I knew the bright colors would work great with this collection. The large tone-on-tone chevron patterns make for great background papers. I decided to use pink on one side of the page (for the girls), and orange on the other side of the page (for the boy). And in between the pink and orange chevron papers, I used a long strip of the colorful heart patterned paper. The black star paper is on the backside of the green chevron paper. I cut a single row of the star paper to add on either side of the heart paper. I love how the black really "pops" next to all the other bright colors. I did pull a small bit of the aqua cloud patterned paper from the Play Date collection, to add the scalloped borders along the top and bottom of the photos. I also added a few feathers to the page, tucking a pink feather on the pink chevron paper, and an orange feather on the orange chevron paper. I added a few chipboard clouds, running the aqua cloud thru a dotted embossing folder. To add some interest to the heart patterned paper, I added coordinating theaded buttons to some of the hearts. The new collections begin shipping a week from today, so they'll be hitting stores really soon. Keep checking in on the Bella Blvd blog as well, as we're sharing more CHA projects all this week and next week. Opps. I got behind in my blogging. I was doing so well last week. This week, and for the next two weeks, we are sharing each and every booth project for CHA Summer over on the Bella Blvd blog. I've had quite a few go up this week, so I'll be sharing my remaining projects here and there over the next week or two. This was one of the last layouts I created for my CHA work, and honestly, it took me the longest to get going. Not sure why. It's such an adorable photo of my friend Krista's oldest daughter. And I had the super fun Snapshots collection to work with. Sometimes there's just too much good product to choose from, that you're not sure where to start. After much thinking, re-arranging, shuffling, I finally got an idea started. I trimmed down the ruled patterned paper to about 11x11, and matted it on the floral patterned paper. I then added long strips of the aqua diagonal stripe designer tape along all four sides, and machine stitched along the edges. I knew I wanted to use the "random thoughts" journaling card, to pick up the blue in Kaitlyn's outfit. And since there are so many fun patterned papers in the collection, I decided to use quite a few of them i small amounts. I cut small pieces from several papers and layered the papers behind the photo to create a frame. The "love you more" heart is from the Paper Pieces die cut pack. I adhered it with pop dots, tucking a feather behind it and adding a white crochet heart to the heart. I added a few border pieces, stickers, and some threaded buttons sprinkled on here and there to finish it off. Make sure and stop by the Bella Blvd blog to find a ton of project inspiration from our CHA designers using the new collections. 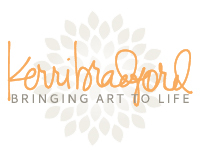 I have some quick cards up today on the Kerri Bradford Studio blog. I was feeling a big burnt out on layouts after finising up all of my CHA projects, so quick and easy cards were exactly what I needed for a quick project. I recently picked up these 6x6 paper pads from Basic Grey, so I decided to work with those for my cards. I love the smaller scaled patterns for card making, although they also work great for layouts. I though the polaroid frames from the Sliders kit would be a great starting point for all of the cards. I sized them to fit the front of a standard sized card. I did have to stretch the frame up a tiny bit (making it taller) to make it fit the card front perfectly. Then I went through Kerri's kits and picked out some words that would work good for card sentiments, and also a few basic shapes like the butterfly, flower, and house. I arranged four polaroid frames on my cutting mat at one time, adding in the sentiments on the side of the frames or even in the center of the frames, keeping in mind that I was cutting from 6x6 pieces of paper. I then laid four different 6x6 patterned paperson my mat and let the Cameo do it's thing. On this first batch, I didn't cut anything from the center of the frames, thinking I might switch the papers around and add a different patterned paper square to the center of each frame. I ended up leaving the centers empty, with the white card base showing. I cut my card bases from white textured cardstock, and spritzed the front of each with some brownish misting spray. I adhered a polaroid frame to each card, and then coordinated a sentiment and a shape from all of the ones that I had cut. I did add some tiny alpha stickers to a few cards to complete my sentiments. And then I finished off each card (with the exception of the house) with a threaded button. Easy peasy, and now I have a nice assortment of cards to add to my stash for quick giving. Today we are revealing our forth new collection on the Bella Blvd blog. Daily Chevies & Everyday Bits is a super colorful collection. There are the large chevon patterns, which we have also seen in other colors spinkled into other collections over the last year, in 6 new colors. I love the monocramatic look of the chevron design, and was excited to see Stephanie mix in a few colors that I suggested. I used quite a bit of color blocking on my layouts this time around. Love the look and it fits my style. I printed out this cute photo of my friend Krista and her family as a 6x6" photo, and built around it with the papers. I also kept with the monocramatic look with my embellishments. Using some white/grey buttons on the white/grey diamond paper, and yellow heart buttons on the yellow heart paper. The chipboard "Family" letters are from an older Ciao Chip Elements set, but the colors matched perfectly with the striped paper. I love that so many of the colors throughout the Bella collections coordinate together, even with the older products. I thought the "Welcome To My Life" pie chart card was a fun one, and would tie in nicely with the photo. I added a chipboard heart piece to the center of the pie chart, to get a bit more pink on the layout. Then I used the tiny alpha stickers from the High Five alphabet sticker sheets to journal on the right side. I coordinated the sticker colors with the color they represented on the pie chart. I did have to dig into some yellow letter stickers from another manufacturer, since Bella doesn't have the tiny alphas in yellow. I lined up my four pieces of chevron paper along the bottom, so that it keeps the perfect chevron design all the way across and the chevrons line up. I then added a coordinating crochet heart to the center of each piece. Today we are revealing the third of our five new collections on the Bella Blvd blog. During the summer shows, you tend to see quite a few fall and winter holiday collections popping up, and Bella is right there with a few new ones to share. This is one of two layouts I created with the Trick or Treat collection. With my girls being older, they don't really do Halloween anymore, and I don't have many photos to pull from years of past, that I haven't already scrapped 7 times before. I knew I could count on my friend Krista to have some cute Halloween photos of her kids, because she alwasys sets up the most adorable backdrops to take holiday photos of her little ones. I think many of you know that I love using Bella's white grid paper on my layouts for a great neutral background paper. The Trick or Treat collection has a new grid patterned included, in case you have a hard time finding the older one. I used a little grey misting spray on the grid paper, and then matted it to the black spider web paper. I used quite a few of the die cut Paper Pieces on this layout. The little label up there is a die cut. I added a little machine stitching to it, and used some tiny alpha stickers to write "Emily". The polaroid frame is one of my favorites in the Paper Pieces package. The colored arrow is a die cut piece as well, and that black grid arrow is from a new sticker sheet that we'll be revealing tomorrow. I do love the Borders paper, and I used 4 of those border strips on the bottom of the page, adding machine stitching between all of them. Today we are up with our second full collection reveal for CHA Summer on the Bella Blvd blog! If you missed yesterday's reveal, keep scrolling down to see the new Snapshots collection, which I am hearing lots and lots of people raving about. And hopefully, this second collection gets just as warm a welcome as the first. I started this layout with an adorable photo of my friend Krista's youngest daughter playing outside, and two of the 4x6 cards from the Daily Details paper (the aqua chevron and the yellow "let your light shine" cards). I arranged those on the page, and just started trimming some of the tone-on-tone patterned papers to fill in the holes. I knew the aqua clouds would go along the top of the page, along with my title. I used the white text chipboard alphas for half of my title, and some aqua alpha stickers for the other half. I also added an aqua scalloped border sticker along the very top of the page, machine stitched it in place, and then curled up the scallops with my fingers to add some texture. I did trim down the yellow 4x6 card a bit on one side so that it fit next to my photo. My goal on this layout was to keep it pretty monocramatic. So I added some green phrase stickers to the green patterned paper, and a yellow chipboard sun to the yellow "let your light shine" card. The aqua chevron card actually says "together" in the center of it. But since the photo is of just little Emily, I thought it would be best to cover that up. I adhered a white feather diagonally across the 4x6 card, and adhered an aqua chipboard heart over the center (which also covered up the staples securing my feather). I added coordinating crochet hearts and buttons to the green and pink patterned papers on either side of the bottom of the page, along with my journaling strips. I finished it off by adding some scalloped punched borders from white cardstock in between the papers, and machine stitching as well. Finally!!! Today is the day that we start our full collection reveals for CHA Summer on the Bella Blvd blog! CHA opens up a week from today in Las Vegas, and I have spend the last month working with these new collections and organizing all of the booth projects with our CHA designers. It's always hard to keep these things secret, when all you want to do is tell everyone about the fun new designs and show off what you've made with them. But the wait is now over, and we are revealing our first collection today! I created this layout for the CHA Summer 2013 Supplement Catalog, using the Snapshots collection. While I have scrapped these photos of my friend Krista's daughter before, I just knew they would be perfect for this collection. There's that cute camera paper! For me personally, sometimes the easiest way for me to use the busier patterned papers is to use them in small pieces. I also love using the Borders patterned paper, mixing in the borders with the border stickers from the Alpha+Bits sticker sheets. I wanted to mix in a few of our more recent embellishments, so I slipped a light pink feather under the main photo and added a crochet heart to the center of the black die cut star. I ended up using three of the 3x4 cards from the Daily Details paper on this layout. They fit perfectly into my clean and linear style. I used a scalloped border punch on some white and black cardstock scraps to add between the photos and the papers along the sides of the layout. 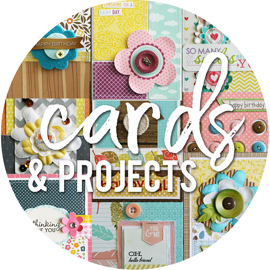 I have another layout and a couple of cards with this collection as well that I will share next week. 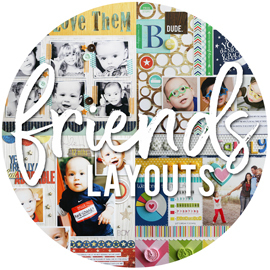 For the past week or so, over on the Scrapbook & Cards Today blog, they have been having a little design team fun. Each of us on the design team have been sharing one of our current designt tips, along with some new projects, and also sharing a little something about us that you might now know. And today is my day to be featured! 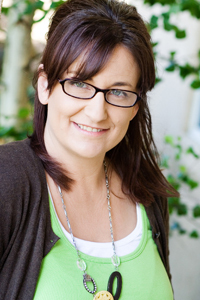 I am talking a bit about re-discovering those tools or products that we buy, collect, and become addicted to using. Only to forget about them somewhere along the way, as they get pushed to the back of drawers, closets, and storage areas. For me, it's my embossing folders. In the past few months, I have purchased a few new embossing folders. I ordered a chevron folder and a honeycomb folder from Stampin' Up, and I found a another chevron folder, a fun star folder, and a woodgrain folder at a scrapbook convention a while back. I haven't really used them much, and decided to make a point to put them to good use for this layout. I pulled out some new papers that I had just picked up, by Allison Kreft for Websters Pages. Totally random tidbit. I thought about buying these papers when they first came out, but then I didn't for whatever reason. When I was teaching at CKU last month, they tossed her paper collection at me, along with a trimmer, and asked me to make some banners to help decorate the photobooth area. I'm glad they did that, because I realized how much I liked the collection. I decided to go with the tone-on-tone patterns, in the green, aqua, yellow, and pink. I love good tone-on-tone papers, and it makes for easier embossing when you don't have an overwhelming pattern going on. I think so, at least. I cut random sized pieces of each paper, and embossed them with one of four different embossing folders. I then lightly rubbed some sandpaper over each paper, to help define the embossed areas. I love the texture it adds to the page. I embellished the page with some coordinating buttons, crochet hearts, and stickers from the coordinating sticker sheet that came with the paper collection. A title cut on my Cameo finished off the page. You can read a bit more from me, and also find out if I'm a messy scrapper or a neat scrapper (for those that may not know this about me), on the Scrapbook & Cards Today blog. Also read back over the last week, and check back during the next few days, to learn more about the rest of the design team. They're a fun and talented group of ladies! I'm getting this post up much later than planned. We took a family day on Monday and spend the day in Santa Cruz. Got home too late to work on anything that night, and today was a blur of work, kids, and craziness. Finally sitting down tonight to work on some blog stuff. Anyways. 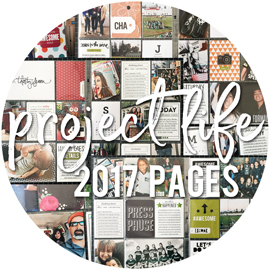 Today, our new monthly project sheet for July went up on the Bella Blvd blog. For the July project sheet, my focus was on Bella's Designer Tapes. I knew from the start that I wanted to create a background with the tapes. And I knew I would then add my photos, title, and anything else to the center of the page. I'll let you in on a little secret. I had no idea what photos I was going to add to this page when I started, or even when I choose the colors of the tapes. I work backwards sometimes, I know. And I randomly came across these photos when I went searching for pics to use, and they were already conviently in this collage that I had created forever ago, when I had intended to use them for a different layout. I loved that they were already ready to print in the collage, and they matched, so it made this layout even quicker. Quick is good sometimes! I picked out six tapes that I thought would make a fun color combination, and cut twenty 2x2" squares from white cardstock. I covered each square with strips of tape, using one design/color of tape for each square. I simply tore off pieces roughly 2" in length, and stacked them onto the square of cardstock. Once it was covered, I trimmed off any excess tape from the edges. Then I took a sheet of cardstock, and started arranging and adhereing the squares around the outside edges of the page. I adhered some squares with the tapes going side to side, and some with the tapes going up and down. And I definately spent WAY too much time deciding in what order to put the squares in, making sure to spread out the colors and patterns in a pleasing way. At the last minute, I decided to add a little extra embellishing with some coordinating buttons. I threaded them and adhered them with glue dots around the page. You can view and download our free July project sheet, complete with supply list and step-by-step instructions, right HERE.